It's rather good I thought. Alas, I cannot claim it as one of the Forum's contributions but all credit to Sergio Musicalman for the creativity and thought put into it. Hi, everyone. This vid is beautiful. the posts on this forum are most intersting. As far as the album "Walk Into Light" itself, I love it. Part of the reason is that is IS so different from anything Ian had done before. The spard=seness of it is what was great about it. To me, Ian was a great SONGWRITER and it didnt matter that keyboards ans synthesizers dominated this album. I loved its darkness and uniqueness. The lyrics. as in all his lyrics, were extraordinary! And to hear Ian just add simple snippets of elec guitar, bass and occasional flute was great. Never understood why people could not see beyond the fact that this "didnt sound like Tull" and appreciate the great songs that were here from a master songwriter. The same, for me, holds true for Tull's "Under Wraps" . I'm in the minority I guess but this was an extraordinary album as well with some of his best songs. So, these 2 albums were DIFFERENT from what people were used to. Big deal. IMHO, they were great for that reason alone! Also read quotes from Ian himself where he sort of disparaged these 2 albums, as if they weren't that important or something like that? Like as if he were just experimenting with synths and computers and such. Both albums were by far the least successful commercially of Ian's output up til then. And it felt like he put them down as sort of "throw-aways" in interviews since then, simply BECAUSE they didnt sell? Dunno. Just know they're both great (to Me0 from a great songwriter/musician. Thanks for you time and courtesy and thanks for this excellent forum! I too like Walk into Light. Perhaps because it is so different from other Tull stuff but also because the songs are of such quality if somewhat on the dark side. I must admit when it appeared I was shocked because I thought Tull had split up (I don't read the music press and have never belonged to a fan club). All words to describe me. I too love "Walk Into Light". What I think its detractors may miss is that the "dark side" that you allude to is and was a fact of life in Britain when the album was made, politically speaking. The eighties were a cold and uncaring decade imo and I hope we never have that kind of attitude again. 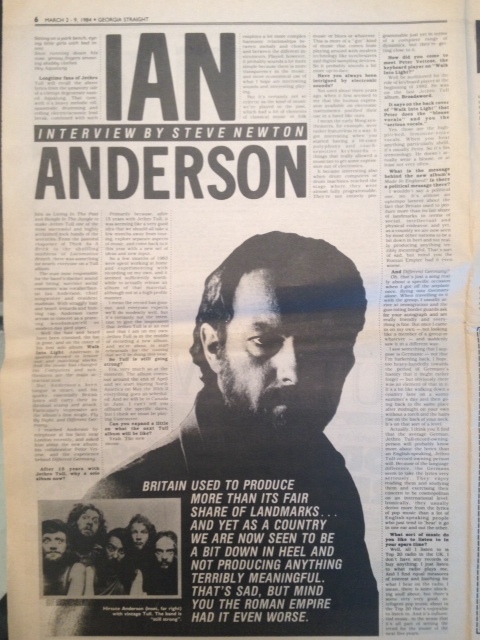 In my final words of the reviews of The Secret Language Of Birds and Rupi's Dance, I wrote that Ian Anderson's first solo album would have a re-release in early 2011. I wrote as well that I was looking forward to it for this album has some fine musical moments. Well, after listening to the new version of Walk Into Light (1983) I can say that it has much more than just 'some fine musical moments'. For me, this debut album released by Jethro Tull's frontman - the album A (1980) was originally intended to be Anderson's solo debut, but was ultimately released as a Tull-album - contains all elements to call it a masterpiece. The compositions are of a very high level and the musicianship is outstanding. You may say that Walk Into Light is actually a duo album since Anderson worked closely with Peter-John Vettese, the then keyboard player of Jethro Tull. The collaboration of Anderson and Vettese was already excellent on Tull's most progressive rock album Broadsword And The Beast (1982). At the time they pleasantly integrated the state of the art keyboard technology in their music. Ian Anderson wanted to explore all possibilities of this modern equipment, but somehow he was afraid that it would discourage the Tull-fans if he should try it out on a band album. Therefore, an already planned solo album could serve as a vehicle to try things out. This experiment worked out very well as I discovered when the LP was released in 1983. The first CD-version was worthwhile listening too and made the album sound even better. However, the CD didn't contain the information of the original album. Thank goodness this second version is much better in all respects. This time all the lyrics have been printed in the booklet together with a list of instruments both musicians used. Moreover, Mr. Anderson wrote some fine liner notes about the album. He stated, amongst other things, that he was glad that he finally could play it on his i-Pod because he only owned a vinyl copy of Walk Into Light. For people who are unfamiliar with the album it's good to know how the songs on the album sound. The ten tracks certainly belong to the best songs Ian Anderson ever wrote alone or together with Peter-John Vettese. I won't get into details about the individual tracks, but one thing's for sure: they all sound as pure progressive rock tunes with strong instrumental parts dominated by keyboards, Anderson's flute and his acoustic guitar. The use of a drum machine might not be enjoyable for all prog heads, but it didn't bother me at all. All that matters are the songs and these are very strong and well-sung sometimes with a lot of emotion. I find it difficult to believe that two musicians could deliver such strong musical performances without any weak spots. Together Anderson and Vettese created the sound of a real band with many influences and hints of seventies bands as Yes and Genesis. But you can also hear influences of electronic music made by bands as Tangerine Dream and Kraftwerk. People who own the Jethro Tull-album Under Wraps, released a year after Walk Into Light, have an indication how this solo effort sounds. Under Wraps again showed that Anderson and Vettese could write and record music with the help of modern equipment and synthesizers. However, the songs never reached the magnificent level of the ones on Walk Into Light. Maybe they used all the strong compositions for this release. For me Walk Into Light is a true masterpiece that deserves the highest possible rating of five stars. You're right, it was an uncaring decade. I was at university 82 - 85 and remember vividly the miner's strike and after that the poll tax and so on. It changed UK politics and IMO not for the better. (I don't want to start a politics debate please, that's just my own opinion and I'm well aware there are plenty of people who won't agree). There is a stark contrast between Walk Into Light and, for argument's sake, Crest Of A Knave some four years later. I think that with the former IA mirrored the chill of the early eighties with, for example, Made In England and Looking For Eden, both great songs and made even greater imo by the clinical and precise arrangements, and Budapest and Steel Monkey from the latter which have a warmer feel to them. Even Farm On The Freeway, which it could be argued has a Thatcher feel to it, is somehow not as clinical as it could have been if it had been on Walk Into Light. As for political debate, I could argue that in fact we all have the same basic opinions via IA's compositional skills. Certainly not overtly left or right wing, but somewhere in the middle and a stance where all viewpoints are seen for what they are, good or bad, and we can make our own individual minds up. Somehow I would guess we'd all be more or less of the same opinions and share the same views. Thatcher had a huge affect on Britain - I'll leave it there. Now I'd be more worried if someone posted in favour of the raving loony UKIP party what with it's gay floods and female "sluts"
Great video...great Portugese lesson....makes me feel a teeny, teeny bit bad about Brazil getting walloped in the World Cup? nahhhh. Brunel's tunnels and bridges bold. The engineer was well hung.